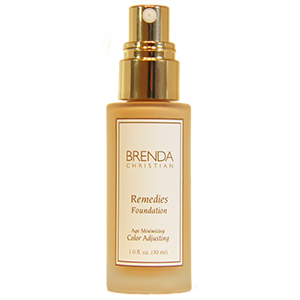 Imagine a perfect, silky-looking skin and a youthful radiance bound together with hydrating, anti-aging protection and you have Brenda Christian’s Remedies Color Adjusting Foundation. Brenda Christian’s chameleon-like foundation color adjusts (up to 30 shades per base tone) with our skin tone as it changes throughout the year. Now, when seasons change, and your skin naturally lightens or darkens due to sun exposure, your Color Adjusting Foundation will change as well. Hypoallergenic, great for acneic skin. Apply one-two pumps into palm of hand. Apply entire amount onto forehead, nose, chin and cheeks spreading evenly over face working away from the center of your face in the direction which facial hair grows naturally. 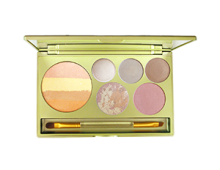 Allow to set for 30 seconds before applying any other cosmetics. 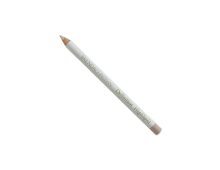 Use the same way with Brenda Luxury Foundation Brush. Pump two pumps into palm of hand, then brush entire amount over face working from the center of the face outward, in the direction which facial hair grows naturally. This is upward and outward on the forehead and outward and downward around the nose and jaw line. Our natural Squalane is derived from olives and is a beautifully hydrating, soothing solution to stressed skin. This good for you ingredient calms and assist in healing stressed skin. The combination of ingredients in Remedies Color Adjusting Foundation calms acne and soothes dry skin. Camellia Sinensis Leaf Extract acts as the perfect soothing anti-oxidant to counter sun damage while destroying free radicals.